Borden, Inc., was an American producer of food and beverage products, consumer products, and industrial products. At one time, the company was the largest U.S. producer of dairy and pasta products. Its food division, Borden Foods, was based in Columbus, Ohio, and focused primarily on pasta and pasta sauces, bakery products, snacks, processed cheese, jams and jellies, and ice cream. It was best known for its Borden Ice Cream, Meadow Gold milk, Creamette pasta, and Borden Condensed Milk brands. Its consumer products and industrial segment marketed wallpaper, adhesives, plastics and resins. By 1993, sales of food products accounted for 67 percent of its revenues. It was also known for its Elmer's Glue and Krazy Glue. After significant financial losses in the early 1990s and a leveraged buyout by KKR in 1995, Borden divested itself of its various divisions, brands and businesses. KKR shuttered Borden's food products operations in 2001, and divested all its other Borden operations in 2005. Borden dairy brands are currently used by Borden Dairy Company for milk and by Dairy Farmers of America for cheese. The company was founded by Gail Borden, Jr., in 1857 in Connecticut as "Gail Borden, Jr., and Company." Its primary product was condensed milk. Struggling financially, the company was saved when Jeremiah Milbank, a partner in the wholesale food distributor I. & R. Milbank & Co. and the son-in-law of banker Joseph Lake, agreed to invest and acquired 50 percent of the stock. The company changed its name in 1858 to the New York Condensed Milk Company. The company prospered during the Civil War by selling condensed milk to Union armies. Borden began selling processed milk to consumers in 1875, and pioneered the use of glass milk bottles in 1885. Borden began selling evaporated milk in 1892, and expanded into Canada in 1895. 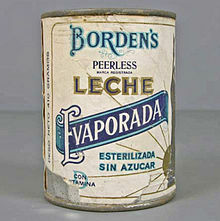 The company changed its name to the Borden Condensed Milk Company in 1899, and became the Borden Company in 1919. It suffered a legal setback in 1912, when a federal appellate court held that the Borden Ice Cream Co. could sell ice cream under the Borden name because Borden's Condensed Milk sold only milk, not ice cream. But the limit on its products was short-lived. It expanded rapidly, buying numerous dairies, ice cream manufacturers, cheese producers, and mincemeat processors. Taking advantage of its many herds of cattle, the company became involved in rendering and the manufacture of adhesives. In World War II, Borden pioneered the American manufacture of non-dairy creamer, instant coffee and powdered foods. Borden Company, York Ice workers packaging product, 1938. Borden became a holding company in 1929, but its operations were re-unified in 1936 and its subsidiaries became divisions. Borden and other dairy companies were investigated in 1938 for violations of the Sherman Antitrust Act, but the charges were dropped after Borden signed a consent decree in 1940. In the 1950s, Borden moved into the printing ink, fertilizer, and polyvinyl chloride (PVC) plastics business. By 1961, it was making 7 percent of all raw PVC in the United States. By 1968, Borden's international chemical and petroleum divisions had grown so large that Borden created the Borden Inc. International division to manage them. The company owned the Danish company Cocio from 1976 to 1999. The food products division was spun off as Borden Food Corporation when Borden, Inc., became a holding company in 1929. The holding company reversed itself thirteen years later when it reacquired its child company. In the 1950s, the parent company went on a buying spree, swallowing up companies such as Wyler's, which made bouillon and powdered soft drinks; ReaLemon, a manufacturer of synthetic and reconstituted lemon juice; Cracker Jack; Campfire brand marshmallows; Wise Foods, a makers of potato chips and other snack foods; and Bama, makers of jellies and jams. Although Borden retrenched in the inflationary 1970s, it embarked on a second wave of mergers and acquisitions in the 1980s. It purchased Guys Snack Foods in 1979. It also purchased the Prince pasta manufacturing concern (giving Borden 30 percent of the domestic pasta market). In 1986, it purchased the dairy products division of Beatrice Foods, including the Meadow Gold brand. Stockholders blamed the company's decline on mismanagement, the incurrence of excessive debt to finance its numerous acquisitions, and several recent restructurings. Borden suffered significant losses for the period 1991-1993. A 1991 restructuring failed to integrate the company's brands and marketing efforts. When whole milk prices dropped in 1992, Borden Food did not lower its prices—causing a significant drop in market share from which it was not able to recover. Borden divested itself of nearly a third of its businesses in 1993 but could not find a buyer for its snack food concerns. In deep financial difficulty, Borden was bought out by Kohlberg Kravis Roberts (KKR) in 1995. KKR increased the pace of divestiture, but was unable to right the company. The company's Borden/Meadow Gold Dairies subsidiary was sold in September 1997 to Southern Foods, controlled by the Mid-America Dairymen (later the Dairy Farmers of America). Borden licensed the use of Elsie the Cow, but retained ownership of the trademark. Southern Foods was acquired by Suiza Foods (now Dean Foods) The dairies are now owned by Dean Foods and Borden Milk Products. Dairy Farmers of America retains Borden cheese. In 1997, KKR focused the company solely on its pasta and pasta sauces lines. But the new strategy failed as well. In June 2001, Borden Food sold several pasta lines to the American Italian Pasta Company and its pasta sauce and soup businesses to the H. J. Heinz Company. In July 2001, Borden Foods sold its remaining pasta lines to the New World Pasta. Borden, Inc., sold its final food product line, It's Pasta Anytime, to Kraft Foods in 2001 and shuttered its Foods division. With the Chemicals business the sole remaining operating company, in 2001, KKR merged Borden, Inc., into Borden Chemical, Inc., with the resulting company named Borden Chemical to emphasize the fact that Chemicals were the company's sole remaining product line. In 2004, KKR sold Borden Chemical to Apollo Management, a private equity firm. Borden Chemical was merged with Resolution Performance Products, Resolution Specialty Materials, and the German firm Bakelite AG to form Hexion Specialty Chemicals. With the merger (which settled in 2005), the last vestige of Borden, Inc., ceased to exist except as spin-offs and brand names. Hexion retained control over the Elsie the Cow trademarks and Borden name until Dec 2014 and has now assigned all Borden/Elsie trademarks in the U.S. to Grupo Lala of Durango, Mexico. Borden once operated a chain of ice cream stores called Borden's Ice Cream, but only a single location in Lafayette, Louisiana, remains, under local ownership. Borden Milk Products is a dairy distributor in Dallas, Texas, with products sold in Alabama, Colorado, Florida, Georgia, Kentucky, Louisiana, Mississippi, Missouri, New Jersey, New York, Oklahoma, Pennsylvania, South Carolina, Texas and Tennessee, among others. Borden Buildings (North Building 563 Spadina Crescent and South Building 487 Spadina Crescent) in Toronto was once home to Borden Canadian dairy operations (founded in 1900 by Walt Massey as City Dairy) and now used by the University of Toronto. ^ a b c d e f g International Directory of Company Histories, Vol. 22, 1998. ^ John Gorman (October 31, 1986). "Borden Buys Beatrice's Dairy Group". Chicago Tribune. Retrieved October 11, 2016. ^ a b Jensen, "Crackerjack Plan? Borden to Sell Some Food Brands," Wall Street Journal, March 21, 1997. ^ "Two Big Dairy Cos. Consolidate". Retrieved 2018-07-22. ^ a b Buchanan, "Borden Foods Turns Out the Lights, Sells Final Holding," Business First of Columbus, August 27, 2001. ^ "Borden Chemical,Inc, Form 10-K, Annual Report, Filing Date Mar 29, 2004". secdatabase.com. Retrieved May 14, 2018. ^ "Apollo Buys Borden Chemical for $649 Million," New York Times, July 7, 2004. ^ "Elsie Borden." Trademark Nos. 77034096; 77104776; 76591578; 3271334. United States Patent and Trademark Office. July 31, 2007. ^ "Borden". Borden Dairy. Retrieved 2013-07-16. ^ "City Dairy Toronto Home". Citydairytoronto.com. 2013-04-05. Archived from the original on 2013-07-11. Retrieved 2013-07-16. "Apollo Buys Borden Chemical for $649 Million." New York Times. July 7, 2004. Buchanan, Doug. "Borden Foods Turns Out the Lights, Sells Final Holding." Business First of Columbus. August 27, 2001. Jensen, Elizabeth. "Crackerjack Plan? Borden to Sell Some Food Brands." Wall Street Journal. March 21, 1997. Wikimedia Commons has media related to Borden (company).